World Premiere of All-New Subaru "Outback"
Tokyo, April 18, 2014 - Fuji Heavy Industries Ltd. (FHI), the manufacturer of Subaru automobiles, has unveiled the all-new Outback (US specifications) at the 2014 New York International Auto Show. The new Outback is the fifth generation of this model since the original version appeared in 1995. The common value linking all these models has been the crossover concept, which integrates the strengths of passenger car and SUV. In developing each generation, Subaru has consistently sought to deliver a presence and value that reflects its flagship crossover model. The Subaru brand has earned the trust of its customers by developing vehicles that acts as a partner to enrich their owners' lives. 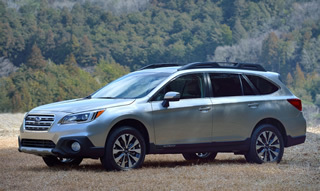 With the new Outback, FHI took this sentiment beyond functional values such as ride quality, environmental friendliness*, and safety features including new "EyeSight" and a rear and side visibility support system, to hone the very essence of the vehicle—the design and quality at the core of its emotional value. * Achieved 33 miles per gallon during highway driving according to Subaru in-house data for 2.5i. Since its inception, the Outback has found a place in the hearts of drivers around the world as the embodiment of Subaru's unique crossover concept, combining passenger-car comfort with the long-distance capabilities and load space of an SUV. In developing the new Outback, Subaru rigorously refined and advanced this concept. At the same time, the company incorporated a host of advanced design features worthy of Subaru's top-of-the-line crossover model to build in a level of strength and quality befitting a vehicle that is a partner in action-packed lifestyles. The greatest value that the new Outback offers to buyers is its capability to continue living up to the trust that drivers place in it as a dependable partner in their active lives. To express a level of quality and functionality worthy of Subaru's flagship crossover model, the exterior design theme was "more Outback." The aim was to achieve a powerful expression of the immediately recognizable style built up by previous Outback models. This has been achieved by a distinctive silhouette that combines the strengths of a passenger car and an SUV, with ample ground clearance, and tough, rugged styling. While maintaining a spacious and comfortable passenger compartment, the basic proportions convey a dynamic, reassuring body shape, and bigger tires and muscular fenders highlight a strong footing that grips the road with All-Wheel drive (AWD). Meticulously crafted, expressive body panels accentuate the sense of quality and class to be expected from a flagship model. Protective panels cover lower body parts to not only protect the vehicle when driving off-road, but also to enhance Outback's active and rugged image. Large front fog lights, functional roof rails, and superior ground clearance further enhance the Outback's characteristic styling. At the front end, the bumper-integrated hexagonal grill and hawk-eye headlights maintain the resemblance to other members of the Subaru family, while the three-dimensional shape of the nose links through to the rest of the body for a more dynamic look. The rear combination lights share the motif of the headlights, projecting a sharp, energetic image, front and back. LED tail and brake lights enhance the sense of quality while improving fuel economy and night visibility. "Comfortable and Sporty" was adopted as the interior design theme to dramatically improve quality and comfort while creating a next-generation interior that offers a sportier driver's area and an improved infotainment system for a more enjoyable in-car experience. The instrument pack features a dual-dial gauge cluster with a three-dimensional feel and a triple-spoke steering wheel with multifunction switches. In the center of the gauge cluster is a large color LCD panel, and blue-ring illumination of the meters in the top-grade models emphasizes the cutting-edge sporty feel. An impressive center panel houses a wide, flat central display* with intuitive touch control. A new generation of interface design makes the screen easy to see and use, enabling convenient connectivity to a variety of media including navigation and audio systems. Particular care has been taken to ensure that the interior materials used and the tactile experience they offer achieve a level of quality befitting Subaru's flagship crossover vehicle. Attention to detail in every aspect, from the soft-pad dashboard to thick-cushioned armrests and the shape and feel of the door handles, imparts a sense of comfort from the moment passengers enter the vehicle. The passenger compartment offers comfort and relaxation. Visibility, cabin space, and world-class safety have been efficiently packaged with strong, sporty styling and a bright, spacious feel. Basic specifications have been enhanced without affecting the vehicle's handling, including refinements to streamline door structure, slimmer door sashes, and a reengineered roof frame to secure ample space. Seating width and shoulder, elbow, and rear leg room in particular have been increased for greater safety and a more comfortable cabin. The A-pillar has been moved forward to expand the cabin area. In addition, front quarter windows were added with door-mounted side mirrors to reduce the front blind spot created by the side mirrors and increase forward visibility. All this has further enhanced safety and made the cabin feel more open. To offer more diverse and secure load-carrying options, rope hooks have been added to the crossbar-type roof rails and a step fitted to the side sill to provide a foothold when loading bicycles or other items on the roof. An electrically powered rear gate* enables automated opening and closing. It can also be set to open to a specific height and also features a reverse function. These features offer outstanding convenience in a wide range of situations, for example when drivers need to open or close the rear gate when carrying long loads on the roof rack. The chassis, steering, suspension, brakes, and all other components have been revamped to offer class-leading performance. Ample ground clearance is teamed with even higher levels of steering stability, achieving higher-quality ride and comfort. Body Roll is further suppressed by increased body rigidity and new suspension mounting positions and new Outback-specific alignment settings to lower the center of gravity, achieving higher ride quality without sacrificing suspension smoothness. Reduced suspension operating friction and improved efficiency is created through a basic layout that enhances stabilizer efficiency, combined with optimization of the front struts and rear shock absorbers, that takes steering stability and a premium ride quality. The body frame shape has been completely redesigned to improve the dynamic rigidity of the rear suspension and its mounting positions on the chassis, thus enhancing ride quality and reducing vibration in the floor and seats. The steering gear ratio has been improved from 16.5:1 to 14.0:1 for a more direct and agile feel. As well as a small, lightweight, high-powered control unit built into the electric power steering, the steering system has increased motor output and finer motor controls to achieve an accurate and natural steering feel. This system also helps to reduce fuel consumption. Building the electronic parking brake into the rear caliper has made the system quieter and more responsive. As well as enhancements to the external look of the vehicle, a 10.6% reduction in wind resistance has been achieved, in particular, by improving airflow over the rear of the body. This also makes a major contribution to reduced fuel consumption at high speeds. In addition to Subaru's unique Symmetrical AWD system, the new Outback is equipped with X-MODE, capable of enhancing driving performance on poor roads through optimized integrated control of engine, four-wheel drive, braking, and other functions on slippery surfaces. The Hill Descent Control setting gives drivers greater peace of mind by maintaining low speeds on downhill slopes. Mid-range torque has been raised on the FB25 boxer engine, giving more control and a lighter feel in practical driving ranges. Significant changes especially to intake, exhaust, and combustion systems have improved fuel economy. While retaining the previous model's structure of the intake manifold and tumbler generation valve (TGV), TGV position and intake port shape have been simplified to balance volumetric efficiency at higher revs with efficient combustion at lower revs, improving both power and fuel economy. The intake sound has been tuned to produce a pleasant engine tone. Subaru has honed the performance of its EZ boxer engine over many years, and teaming it with high-torque-compatible Lineartronic transmission has improved both driveability and fuel economy. The lighter, next-generation ECU uses a microcontroller enabling improved environmental friendliness. Power and environmental friendliness have been enhanced for increased fuel economy. To complement the smooth shifting that Lineartronic transmissions are known for, new step shift control and six-speed manual-mode paddle shifting achieve nimble performance that always stays true to driver intentions. Transmission friction has been reduced for improved fuel efficiency, and new dynamic dampers provide a quieter ride by quelling vibration noise. Teamed with the 3.6-liter boxer engine, the high-torque-compatible Lineartronic transmission achieves advanced levels of power and environmental friendliness. Torque converter, oil pump, and forward-reverse mechanism have all been redesigned, while new step shift control and six-speed manual-mode paddle shifting improve driveability and ensure a quieter ride. Building on a strong body structure, both active and passive safety features traditionally found on the Outback have been refined for improved omnidirectional safety performance. Additions include the new EyeSight that dramatically improves preventative safety and reduces driver load; rear and side visibility support features comprising Blind Spot Detection, Lane Change Assist, and Rear Cross Traffic Alert; and Steering Responsive Fog Lights that illuminate to maintain good forward visibility as the vehicle rounds a bend at night. New EyeSight incorporates fully revamped stereo cameras that increase viewing angle and range by approximately 40% to further improve preventative safety and driver stress-reduction features such as Pre-Collision Braking Control and Adaptive Cruise Control. SRF automatically turns on the fog light on one side during cornering at night to improve visibility. In consideration of oncoming vehicles, this function can turn the fog lights on and off automatically according to the steering angle and driving speed. BSD flashes LEDs to alert the driver to vehicles in blind spots behind the C- and D-pillars to the rear. If the driver indicates to change lanes while a vehicle is rapidly approaching in an adjacent lane, LEDs in the door mirror flash to alert the driver. RCTA emits an audible warning if it detects risk of a reversing collision with a vehicle approaching from the left or right. If a vehicle approaches laterally while the driver is in reverse, LEDs flash an alert in the door mirror, an icon is displayed in the rear-view camera monitor, and the speedometer emits a warning sound to alert the driver.